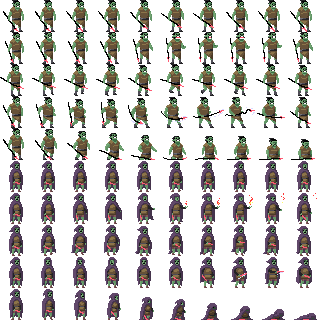 Animated Orcs by Calciumtrice, usable under Creative Commons Attribution 3.0 license. Credit should be given to Calciumtrice. I can be found on twitter as @Calciumtrice if you'd like to contact me or see my work at calciumtrice.tumblr.com. I am available for commissions! Did you use any software for animations? or just one image above other? Yeah, just regular drawing software, draw as it would appear as the spritesheet, side by side, and export and throw it into an animator as I go to check it. I put the weapons on a separate layer, so they'll be more easily changable, and sometimes arms and legs. Thanks for this one too.